I bought this delightfully original Ladies Triumph several years ago. The previous owner used to display it at a museum in Portsmouth, but visitors had started stealing parts from it so he withdrew it. This Triumph Ladies Special Tourist was a classy bike in its day, with extra features such as Resilian brakes and quick-release nuts. I’ve given it the once-over mechanically, so now it rides well, but obviously I’ve preserved its patina. When I obtained it in 2008, I’d been searching for quite a while for a pre-Raleigh Triumph. (BSA took over Triumph Cycles in 1951 and was absorbed by Raleigh in 1956). But they’re no longer easy to find. 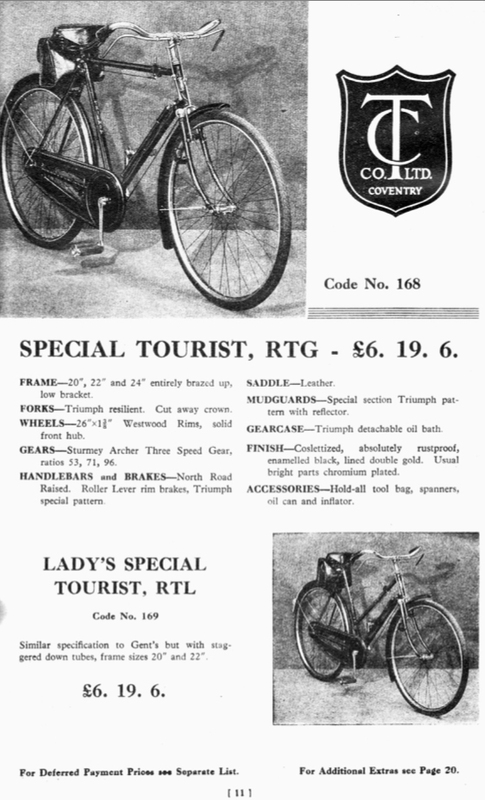 The Ladies Model (RTL) cost £6 7/- 6d in 1937. I’m not sure of the price of the 1938 model, as the only catalogue I’ve found so far is the 1937 one featured here (and there are a few differences between the 1937 catalogue bike and this machine). The matching Triumph pump is a nice touch. The difference is the staggered down tubes on the catalogue bike. To me, full oil-bath chain cases sum up that past golden era of cycling when the roads were still empty (though, actually, they were nevertheless much more dangerous to cyclists). If your cycle was too classy to paint a white tip on the rear mudguard as per the wartime requirements, you could always buy one of these Bluemels accessory white mudguard tips. UPDATE: There’s now a new Triumph on the scene, a 1931 Gents Gloria Full Roadster. It remains to be seen if he tries to muscle in on the wartime romance.